The San Jose Museum of Art is an art museum in Downtown San Jose, California, USA. Founded in 1969, the museum hosts a large permanent collection emphasizing West Coast artists of the 20th- and 21st-century. 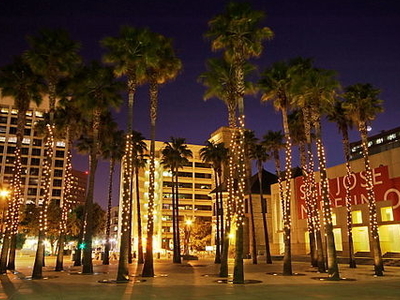 It is located next to the Circle Of Palms Plaza and Plaza de César Chávez park. The museum's historic wing was originally designed by architect Willoughby J. Edbrooke and built as the San Jose post office in 1892, then served as the city's library from 1937 to 1969. The building was then converted by The Fine Arts Gallery Association, reopening as the "Civic Art Gallery". 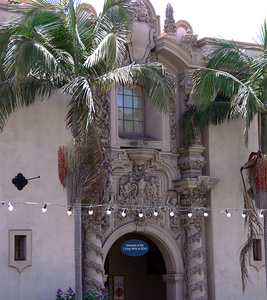 In 1972 the building was named a California Historical Landmark (#854), and in 1973 it was added to the National Register of Historic Places. The "New Wing", comprising the majority of the current exhibition space, opened in 1991. The permanent collection focuses on 20th- and 21st-century art, with a focus on US West Coast artists and a growing emphasis on art of the Pacific Rim. The collection includes more than 2,000 works in a variety of media, including sculpture, paintings, prints, digital media, photographs, and drawings by artists such as Frederick Spratt, Robert Arneson, Milton Avery, Gregory Barsamian, Joan Brown, Deborah Butterfield, Jim Campbell, Enrique Chagoya, Dale Chihuly, Ron Davis, Jay DeFeo, Roy DeForest, Tony Delap, Richard Diebenkorn, Jim Dine, Rupert Garcia, Philip Guston, Oliver Jackson, Il Lee, Hung Liu, Michael McMillen, Manuel Neri, Long Nguyen, Manuel Ocampo, Nathan Oliveira, Deborah Oropallo, Alan Rath, Raymond Saunders, Richard Shaw, Wayne Thiebaud, Bill Viola, and William T. Wiley. In 2007 the San Jose Museum of Art won the prestigious MUSE award from the American Alliance of Museums Technology Committee. The award was for SJMA's Artist of the Week podcast and won in the category Extended Experience. The museum also won a MUSE award in 2009. The gold award for Public Relations and Development was given to the San Jose Museum of Art for its in-house produced "Road Trip" video (a.k.a. Giant Artichoke video). The Giant Artichoke Video features a wild shoe-wearing traveler on a road trip to Castroville, CA who visits a quirky landmark and sends a postcard to SJMA. Created for the exhibition Road Trip and capitalizing on the common experience of a summer road trip, the goals of this hybrid marketing and interpretation project were threefold: to create buzz around the exhibition, sow the seeds for a participatory experience both outside and inside the Museum, and build connections between the Museum's online audience and onsite visitors. Here's the our members favorite photos of "Museums in San Jose". 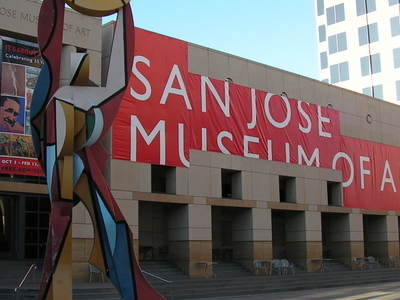 Upload your photo of San Jose Museum Of Art!